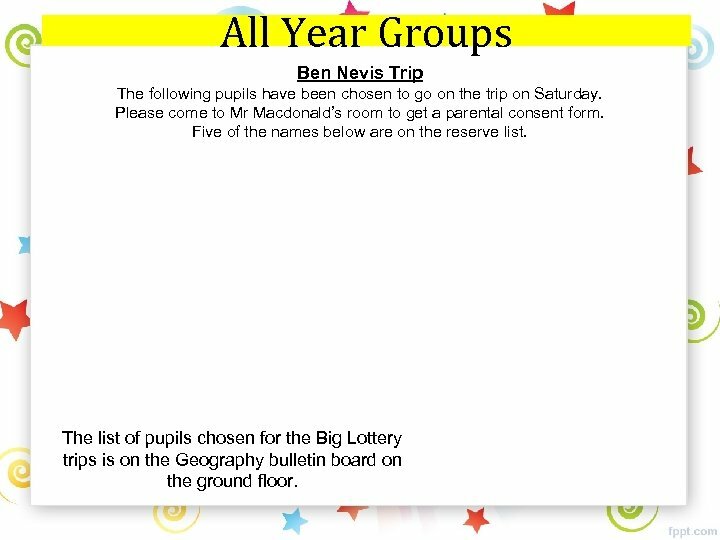 All Year Groups Ben Nevis Trip The following pupils have been chosen to go on the trip on Saturday. Please come to Mr Macdonald’s room to get a parental consent form. Five of the names below are on the reserve list. The list of pupils chosen for the Big Lottery trips is on the Geography bulletin board on the ground floor. 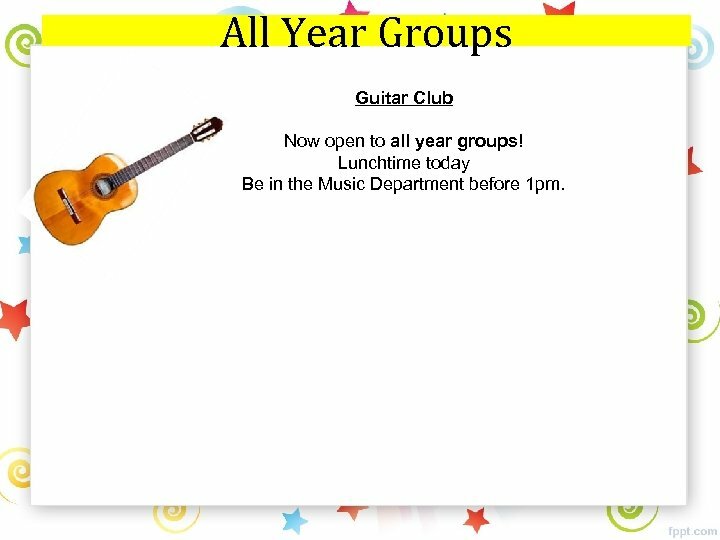 All Year Groups Guitar Club Now open to all year groups! 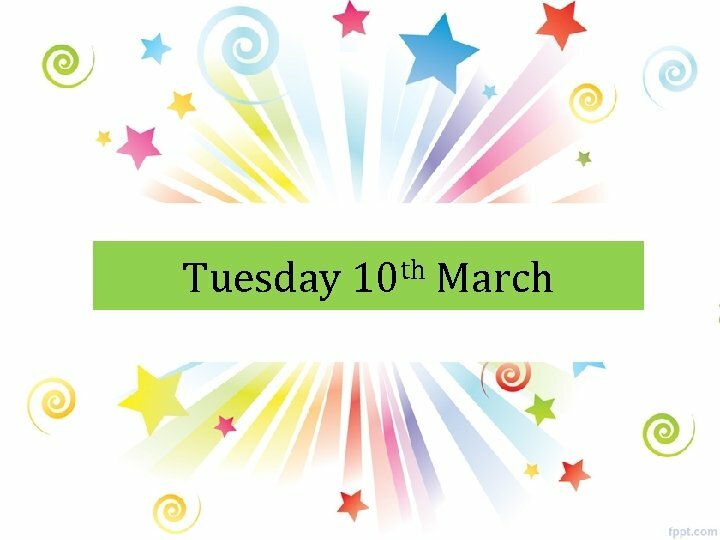 Lunchtime today Be in the Music Department before 1 pm. Clubs Guitar Club Mr Mc. 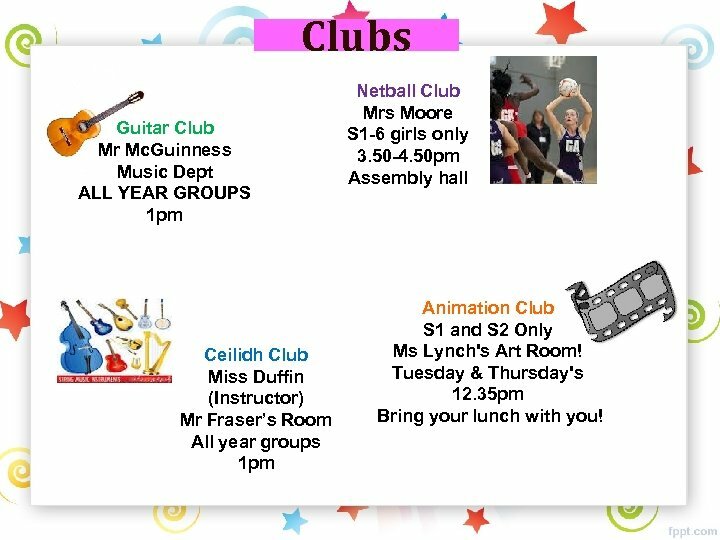 Guinness Music Dept ALL YEAR GROUPS 1 pm Ceilidh Club Miss Duffin (Instructor) Mr Fraser’s Room All year groups 1 pm Netball Club Mrs Moore S 1 -6 girls only 3. 50 -4. 50 pm Assembly hall Animation Club S 1 and S 2 Only Ms Lynch's Art Room! Tuesday & Thursday's 12. 35 pm Bring your lunch with you! 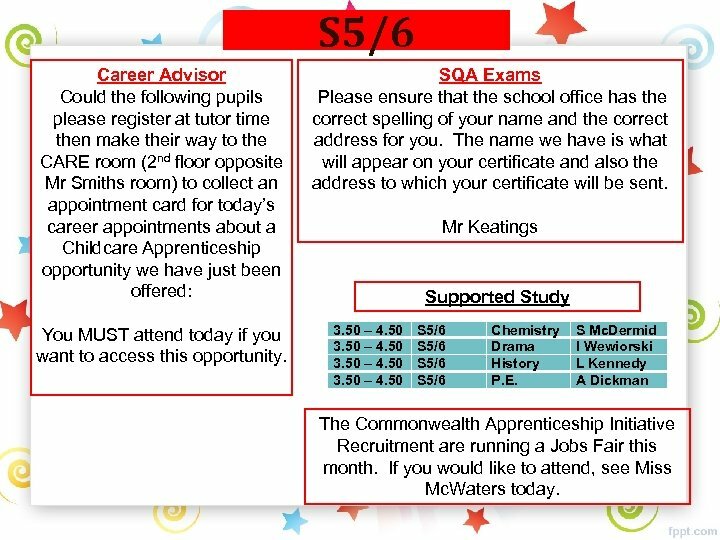 S 5/6 Career Advisor Could the following pupils please register at tutor time then make their way to the CARE room (2 nd floor opposite Mr Smiths room) to collect an appointment card for today’s career appointments about a Childcare Apprenticeship opportunity we have just been offered: You MUST attend today if you want to access this opportunity. SQA Exams Please ensure that the school office has the correct spelling of your name and the correct address for you. The name we have is what will appear on your certificate and also the address to which your certificate will be sent. 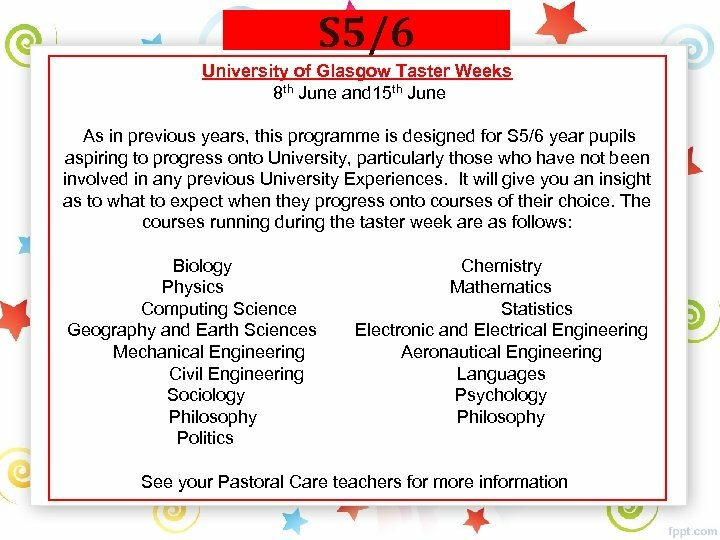 Mr Keatings Supported Study 3. 50 – 4. 50 S 5/6 Chemistry Drama History P. E. S Mc. Dermid I Wewiorski L Kennedy A Dickman The Commonwealth Apprenticeship Initiative Recruitment are running a Jobs Fair this month. If you would like to attend, see Miss Mc. Waters today. 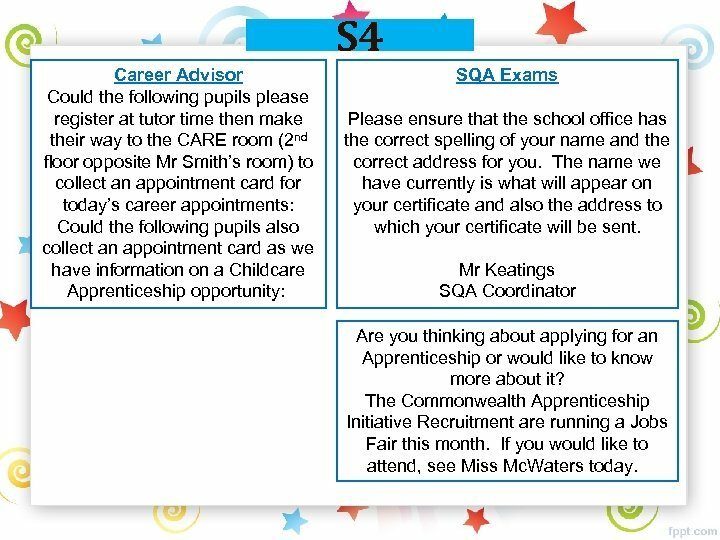 S 4 Career Advisor Could the following pupils please register at tutor time then make their way to the CARE room (2 nd floor opposite Mr Smith’s room) to collect an appointment card for today’s career appointments: Could the following pupils also collect an appointment card as we have information on a Childcare Apprenticeship opportunity: SQA Exams Please ensure that the school office has the correct spelling of your name and the correct address for you. The name we have currently is what will appear on your certificate and also the address to which your certificate will be sent. Mr Keatings SQA Coordinator Are you thinking about applying for an Apprenticeship or would like to know more about it? The Commonwealth Apprenticeship Initiative Recruitment are running a Jobs Fair this month. If you would like to attend, see Miss Mc. Waters today. 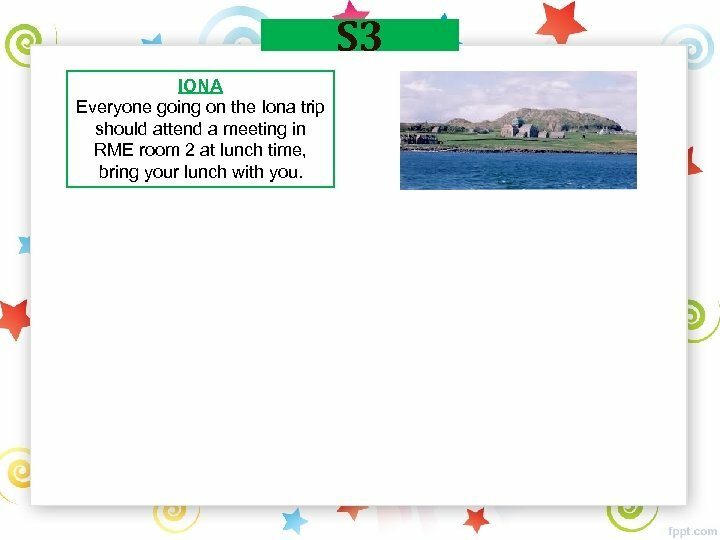 S 3 IONA Everyone going on the Iona trip should attend a meeting in RME room 2 at lunch time, bring your lunch with you. S 2 IONA Everyone going on the Iona trip should attend a meeting in RME room 2 at lunch time, bring your lunch with you. S 1 IONA Everyone going on the Iona trip should attend a meeting in RME room 2 at lunch time, bring your lunch with you.